Last night I decided to go for it. The simplest thing I could think of was to make sweet potato fries, which I’ve had in restaurants before and always enjoyed. Preheat the oven to 450 degrees. 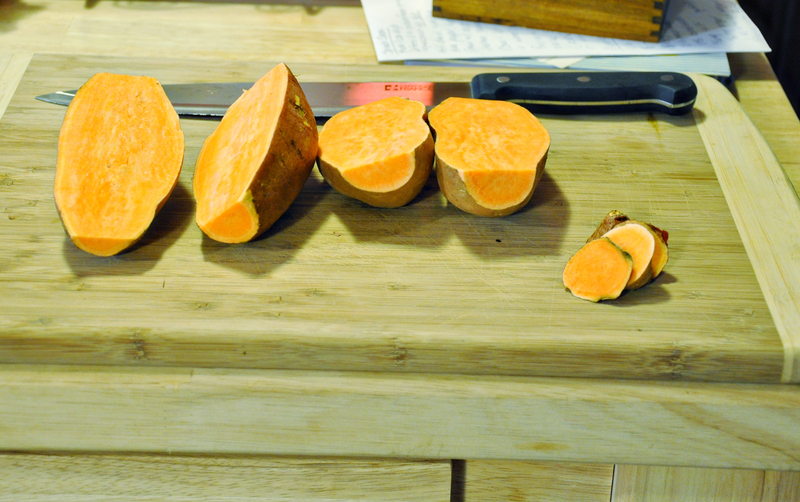 Rinse the sweet potatoes to remove any dirt on the skin. Dry them completely. I left the skin on, but you can peel it off if you prefer. Slice a coin off of each end to remove the pointy ends. Now slice them in half. Continue slicing until you have nice and even wedge sized pieces. Pour a few tablespoons of olive oil into a large bowl and dump in the potato wedges. Mix them around until they are coated and glistening with the oil. Season them with a generous amount of salt and pepper. 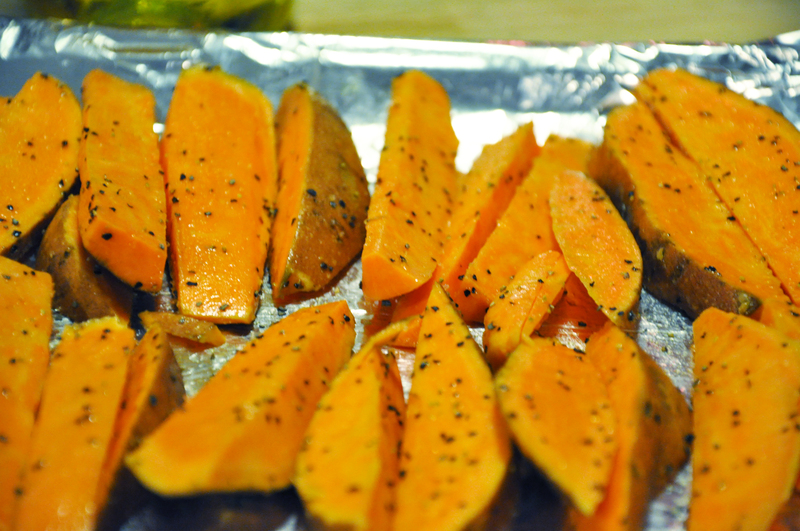 Spread the wedges out on a nonstick baking sheet, or on foil if you want an easy clean up. Bake them for 20 minutes. You’ll hear them sizzling, but don’t open the door. They need all that heat to get crispy. After 20 minutes, take them out and flip them over. Return them to the oven and bake for an additional ten minutes. Remove them and let them cool before you eat them. Sweet potato fries are difficult to make. I read a little bit about them afterwards, and everyone seems to have a difficult time getting them crispy instead of mushy. The trick seems to be to use high heat, and try to keep them from touching each other on the baking sheet. Mine were touching and came out a little mushy, but they were still DELICIOUS. Fries need dipping sauce right? 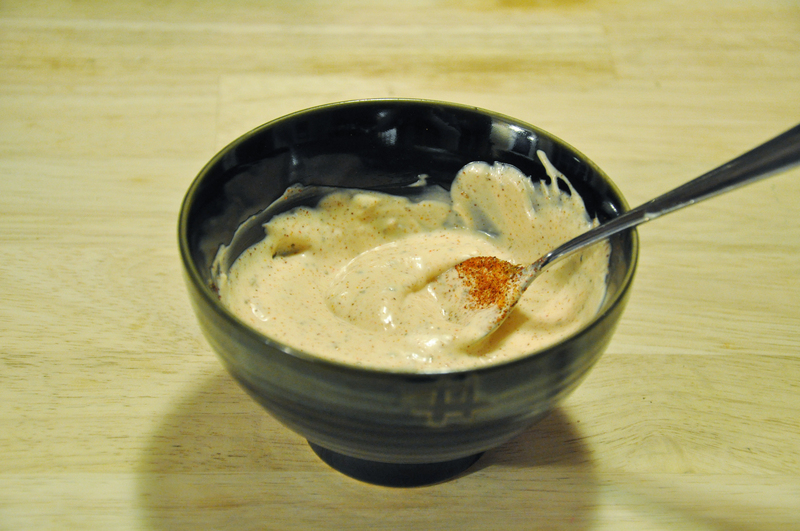 I used two spoonfuls of mayonnaise and one spoonful of ketchup, with several shakes of chipotle chile pepper spice to make this dipping sauce. These tasted so good together, we didn’t wait for them to cool off, and ended up with singed fingers. And I’m using the rest of the dipping sauce as a sandwich spread today. 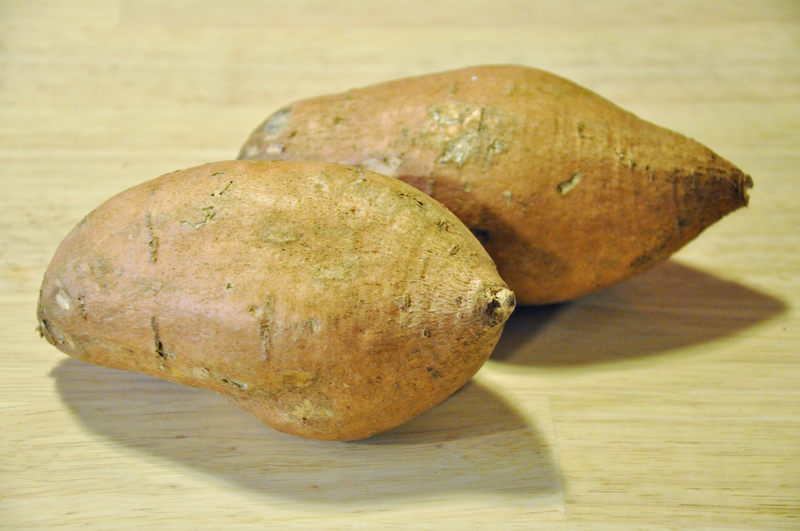 Sweet potatoes are loaded with fiber and important vitamins, so you can eat these up guilt free. Dan wants me to make these!